last monday was my third visit to so vino and my most memorable. why, you ask? because monday nights are 1/2 off bottles of wine night... so we ordered three! we started off with the jansz brut rose, a sparkling wine from tasmania that was wonderfully priced on the wine list for $24 a bottle. do the math kids. yes, we paid $12 for it. 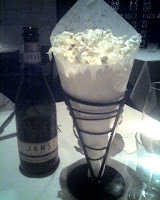 it paired nicely with truffle popcorn tossed in truffle oil and then sprinkled with finely shredded white cheddar. it was served in a paper cone and it was great to find cheese sprinkled throughout the whole order of popcorn and not just on top. this stuff was awesome! 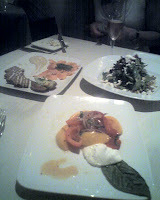 then our flights of apps arrived and included the roasted beet & goat cheese salad, the heirloom tomato & burrata cheese salad, and the house-cured salmon. both salads were wonderful and very well dressed, i would order them again. the cured salmon was served on a cutting board with dijon shallot remoulade, boiled potatoes w/ fresh dill, and pumpernickel bread layered with butter. the salmon was a little bland but was delish with remoulade and potato. the pumpernickel didn't need the butter addition. next we opened our second bottle of wine, the 2006 turley juvenile zin. the half off price of $24 was a steal b/c it's hard enough just trying to get your hands on a bottle of it. 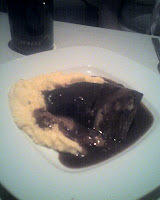 it paired perfectly with the braised short ribs and gruyere polenta. the short ribs were a little too reminiscent of pot roast, but still good. 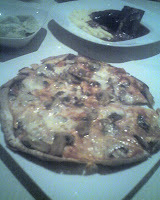 we also ordered the truffled taleggio and mushroom pizza which wasn't anything too exciting. the red sauce on the pizza was too overpowering for the taleggio and i could smell the truffle oil more than i could actually taste it. the really, really thin crust reminded me of a chewy cracker. i'll definitely save my pizza cravings for dolce vita across the street. 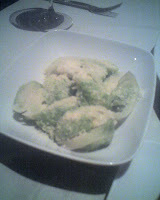 a side of brussel sprouts were made even more tempting by sprinklings of parmeggiano reggiano on top. before ending our meal, we couldn't resist ordering the other turley on the menu - the 2006 turley old vines, also a zin. we wanted to taste both turleys at the same time and we could easily afford to at these prices. (i preferred the juvenile, the old vines was a little too spicy for my taste). this bottle was also $24. we drank a third of this bottle, popped the cork back in and took the rest back to my house to finish off the night. an order of smores was fun for the pyros at the table (all 3 of us), we even shared with a neighboring table. continuing the theme of decadence, we got a second dessert - the mosaic - which was a vanilla semi-freddo wrapped around mango and raspberry sorbets and sliced. it was delicious. service was amazing. the owner of so vino kept stopping by our table to check on us too. i believe my girls and i have found our new monday night spot. You naughty girl!! Don't you dare drink all of Helen Turley's goods before I get there! Oh, and they serve food too.